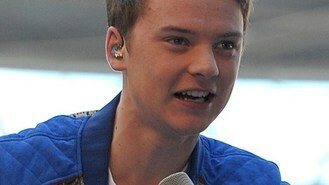 Teenage pop star Conor Maynard has rocketed to the top of the charts with his debut album Contrast. The 19-year-old shunted Plan B's album Ill Manors, the soundtrack to the film of the same name, off the top spot. Maynard, who has been dubbed the UK's Justin Bieber, also notched up a second week in the top 10 singles chart with Vegas Girl at number nine. Top spot in the singles chart went to East London grime star Wiley, the Official UK Charts Company said. His track Heatwave, narrowly pipped Calvin Harris featuring Example's new entry We'll Be Coming Back to the post. The two new entries forced last week's number one, Spectrum, by Florence and the Machine into third. Teenager Maynard rose to fame after his YouTube covers gained thousand of views and he was crowned MTV's Brand New for 2012 over Lana del Rey. His debut album, co-produced by Frank Ocean, boasts collaborations with Ne-Yo, Pharrell and Rita Ora. Emeli Sande, whose performance during the Olympics opening ceremony was watched by billions around the world, rose to third spot in the album charts. Her album, Our Version of Events, one of the biggest-selling albums of the year so far, jumped up five places from number eight. Londoner Delilah, real name Paloma Stoecker, entered the album charts at number five with her new album From The Roots, while Mike Oldfield, who also appeared at the Olympics opening ceremony, debuted at number six with his best-of compilation Two Sides. Elsewhere Olympic fever saw a bevy of artists featured in Danny Boyle's spectacular £27m curtain-raiser surge up the singles charts. Underworld's Caliban's Dream, which was written for the event by the electronic group's Rick Smith and sung by Two Door Cinema Club's Alex Trimble, shot up from 69 to 12, narrowly missing out on a first top 10 hit in 16 years. Sheffield four-piece Arctic Monkeys' cover of The Beatles Come Together moved from 67 to 21, and Frank Turner's I Still Believe rose from 97 to 40. Stevie Wonder is ending his 11-year marriage to fashion designer Kai Millard Morris. Calvin Harris has joined the list of performers at the iTunes Festival. Charlotte Church channelled her inner rock chick as she performed at an intimate venue in Brighton this week. Adele and Ed Sheeran led the way as sales of digital albums passed the 100 million mark. Mariah Carey has revealed how her new single Triumphant (Get 'Em) was inspired by her own experiences. One Direction's Niall Horan and Liam Payne surprised shoppers at Westfield London with an impromptu performance. Ice-T has claimed that rap is still a very male-dominated industry. Lily Allen has announced she is changing her professional name to Lily Rose Cooper. Snoop Dogg has put himself forward to join the judging panel of American Idol.